← If your name is Andrea, skip this post. That is, Bollywood Movie Review, #3 (or What I Write About When I Can’t Think of Anything Else or I’m Reviewing It So You Don’t Have To Watch It But You Totally Should Anyway). So. Today’s installment is Koi…Mil Gaya, for which I have a strange affinity. And I totally get it but it is strange (see, I have a similar affinity for any movie that features a person who can be described as “special needs,” something I believe stems from various experiences in life volunteering to work with special-needs-type people, but I digress). Anyway. Rohit becomes totally normal and hot eventually so I don’t feel bad. Right. I saw Krrish back at Christmastime. My father-in-law had purchased it through a coworker who had gone to visit his family in Pakistan, and I think he paid maybe 90 rupees for it? Maybe? Not a lot. It was the best 90 rupees anyone has spent. It kept my husband and I entertained for not one, but two whole evenings! And then the FIL informed us that his coworker’s 6-year-old son really loves it. I am not at all surprised; I am perpetually 5, so I am in the correct age bracket, apparently. I then became curious about Koi…Mil Gaya. I had heard it had won Hrithik (I like how we’re on first-name terms now, despite never meeting, don’t you?) a Filmfare award for best actor, and so has to be pretty good, right (all cheesy commercial spinoffs aside)? I must say I was not disappointed. I started to watch it with a friend, who couldn’t make it past the part where grown-up Rohit tries to apologize to Nisha (Preity Zinta) for playing a trick on her (though I don’t find tricky youngsters as charming as I think I’m supposed to; my actual age might figure in to this somewhat). I took it home and watched the rest by myself, while the husband worked on something useful in the other room and shook his head at me periodically. 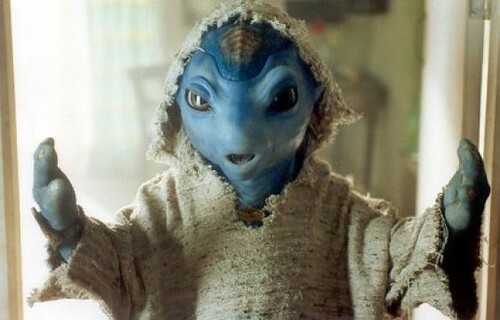 And now when I see other Hindi films and someone says “jadoo,” I giggle to myself. This entry was posted in Cool things, General stuff, india. Bookmark the permalink. Strangely enough “Koi.. Mil Gaya” came up on my Netflix recommended list this morning ! I’m going to have to wear my tin foil hat while browsing on their site. “vaudevillian villain” – yipes! That seems like a cute movie.. I will have to look for it on Netflix.